Have a sewer problem in Connecticut? Don’t know what it is or where to dig? Back in the “old days,” people just guessed where to dig. Now, with sewer video cameras and locating equipment, it’s just a simple matter of calling Medina Sewer and Drain for a sewer video inspection and locating the problem. Our high-skilled technicians can visibly identify exactly what is wrong with your pipes before you commit to a specific procedure. This can save you a ton of money. 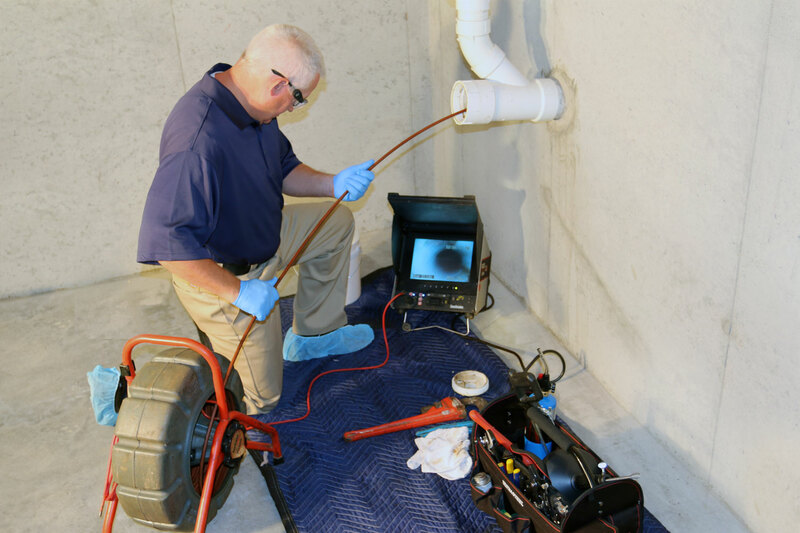 Sewer Video cameras have become one of the most valuable tools in the plumbing business. Specially made fiber optic cameras allow for a visual inspection of underground sewer lines and other piping to determine the condition of the inside of the pipe. A flexible rod with a high-resolution color video camera on its tip is inserted into the pipe for inspection. Video images are transmitted to the camera operator in real-time and can be saved onto a videotape for a permanent record. Radio transmitters on the camera record the depth and physical location from the surface so that defects and obstructions can be corrected cost effectively. If you choose to do an entire sewer line video inspection, you will see a “walk-through,”leading from the trap, down through the sewer line, and up to any obstructions. If the camera can push through the blockage, it may continue through to the municipal line. The camera unit has a transmitter. The video technician/plumber will stop the camera at the blockage point. Then he will go up to ground level and wave a locating device until the device picks up the transmission signal. This allows him to spray a paint spot at the exact point of blockage. Radio transmitters on the camera record the depth and physical location from the surface of any defect or obstructions so that your technician can accurately diagnose and solve any drain line concerns. There is no guesswork, so your problems will be resolved quickly and cost effectively. A video camera line inspection pipe will identify all types of problems, such as root intrusion and pipe that is misaligned, broken, punctured, off-grade or corroded. The camera also identifies grease buildup, leaks and obstructions. The inspection can be repeated after any service is performed to verify that the line has been properly cleaned or repaired. A video camera inspection is recommended if you experience repeated drain line backups, slow drains or clogs. Additionally, a video camera inspection before you purchase a home will help ensure that sewer lines are free of problems that can cause headaches and expensive repairs after you move in. Drain back-ups, gurgling and other draining problems are often an indication of blockage in the sewer line. This can be a relatively minor issue or a very big problem—and until recently, there was no sure way of determining the cause without expensive, destructive excavation of the pipes. Now we can offer no-dig trenchless solutions that can fix your problem at a fraction of the cost.